An abstract that depicts the circle of life, circle of transmigration from one birth to another in various species, a total of 84 million species including plants, animals, and ultimately humans. "From dust we arose to dust we shall go" the abstract encompasses the infinite power of trans-universal divinity in the cycle of re-incarnation. We live amid nature and face Spring, Summer, Fall and Winter. With different seasons the landscape changes just as we humans change and grow with each passing day. There are personalities in us such as cheerful, bubbly, grim and harsh; as seasons in nature. All the attributes makes humans complete as the cycle of nature is evident in the form of growth of new life in Spring and demise of old leaves during Fall. We just want to make sure that good human qualities outweigh the less favored characteristics in each one of us. 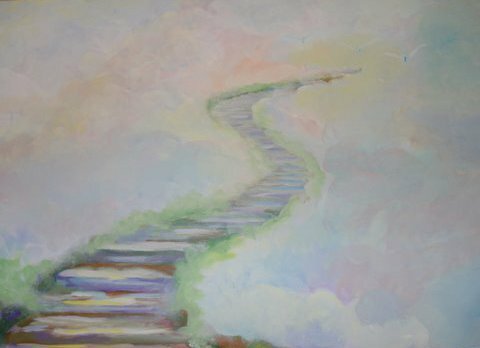 Whether it is a vacation you are thinking of or spirituality whatever gives happiness is what this painting is all about. A quill is a translucent basal part of a feather that was a writing tool in ancient times. 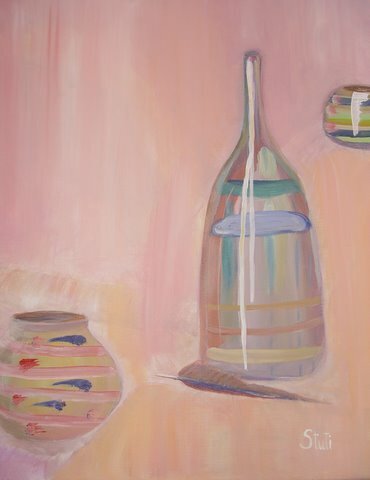 The painting draws inspiration from things long gone that were day to day items reclaiming the purpose of things in our daily lives. The things that are important to us today may lose its reverence tomorrow, thus showing us the changing needs of modern living and changing attitudes of human beings. 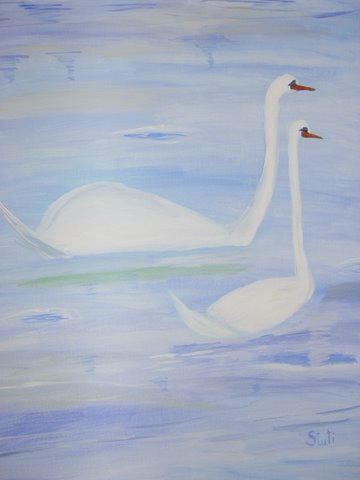 During my travel to Switzerland, I stumbled upon a surreal sight of a pair of swans closely basking in the warmth of dusk reflecting on a lake like a mature couple walking hand in hand at a park. I clicked some pictures and they went into my folder of things to paint after I get home. 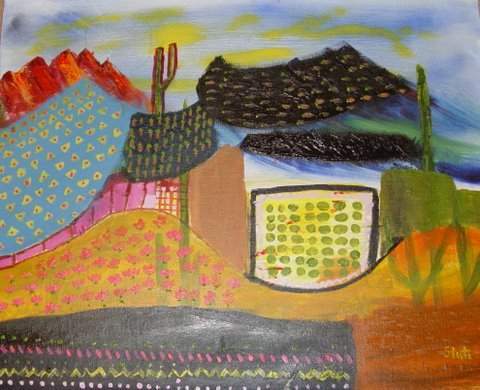 The painting is a culmination of the thought put into action. The Buddha idol was one of the photographs that I clicked during my travel to Thailand. 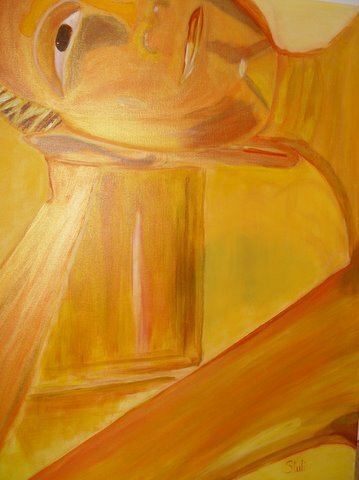 I attempted to capture the beauty of the great Buddha on canvas and enjoy the placidity of Gautama Buddha's posture. Music is all around us. We just need to stop and listen. It could be the chirping of the birds at dawn, tic-tock of the clock when we wake up, the sound of rain on the umbrella, sound of waves splashing the froth over sea, the whoosh of wind as the trees sway or the pitter-patter of hail falling rhythmically. 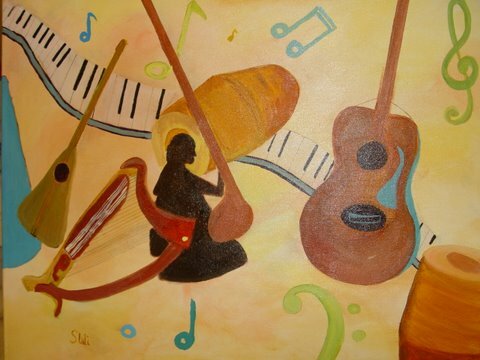 If we pay attention the melody surrounds us into a musical retreat. Spirituality comes in a variety of flavors, meditation for the one who follows the Path. 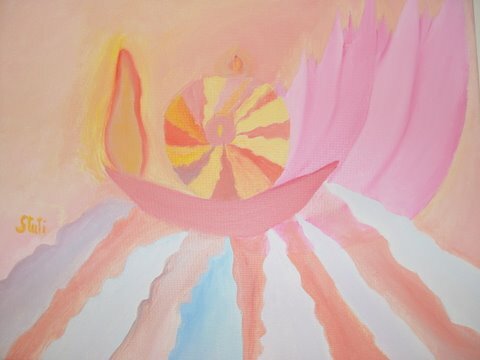 The lamp that lights our inner journey towards our true home and the rays that emanate from this lamp show us the peace and tranquility that lie in the comfort of the petals of lotus that feel like a thousand pink petals. The painting gives a feeling of warmth to whosoever beholds it. We were in Buenos Aires planning to travel to Iguazu Falls when my hubby got the flu and we decided not to go further. 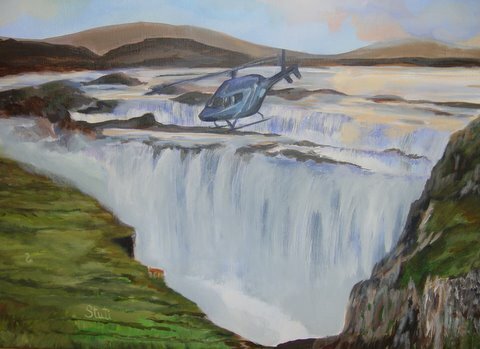 The painting is a combination of pictures of Iguazu Falls that I had seen in travel books and my imagination of how I perceived the site to be. My daughter was in pre-school; one day she came back home and after eating her lunch proclaimed that she wants to play with the ducks outside. I stood in the balcony of the first floor of our apartment and watched her circle the ducks. One of the duckling was not moving. She came upstairs, emptied her tiny backpack in a hurry to go back. When I asked what she was doing she said that she was going to bring the baby duck home in her backpack and make that her pet. I tried to explain to her that the duckling is sleeping and has gone to heaven, that she has passed away into a slumber that no can awaken her. My daughter looked at me a little confused. I explained further that "the duckling will continue her journey in another land, perhaps in paradise with God. When a person dies they go back to God." The four-year-old seemed to understand and innocently nodded, "O, Ok." That was one of her early lessons about death. Meanwhile, I called the rental property's maintenance manager to give the duckling a final place to rest. 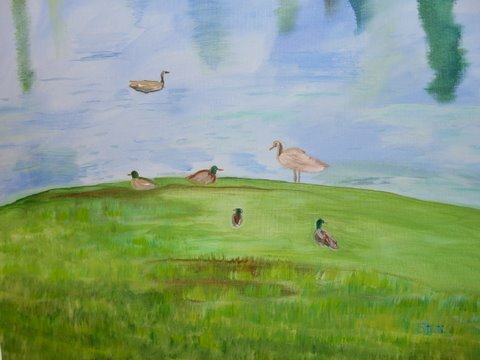 As I painted the canvas, I cherished all the wonderful moments with my daughter, now a teen. I live in Seattle and feel that we all have our guardian angels, well-wishers and friends taking care of us in some form or another. 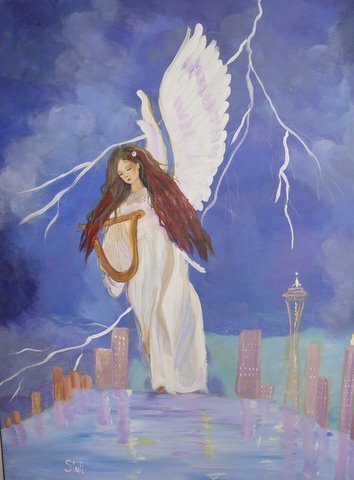 Here is a painting of an angel or a super-power whatever you may call the divine power, protecting the rainy city during the obstacles of thunderstorms and lightning in one's life. The reflection of city lights in water during the brief moment of lightning reminds us to stay in the present and not worry about the past or the future and gives us a glimpse that everything in this world is transitory. Kabir Das and Maulana Ram talk about intriguing sights to behold when a person is in deep meditative state. 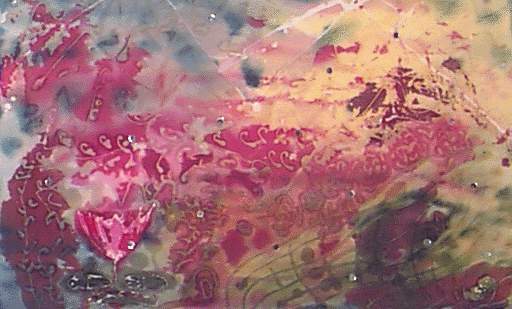 This painting is a reflection in anticipation of those wonders that our inner being holds for us. References are found in Hindu scriptures about a thousand petalled lotus imagery when we go beyond the third eye. Sufi saints describe that the radiance of the sun is brighter beyond what can be expected when the soul is in trans and they are represented by the mirrors on this surface design art. Process: The colors were laid one at a time, then the fabric was rinsed to get the access color out, dried, ironed and desired patterns were made with hot wax then each new color was applied and the process was repeated for this surface design. Mirror embellishments were done as a final touch to the art piece. 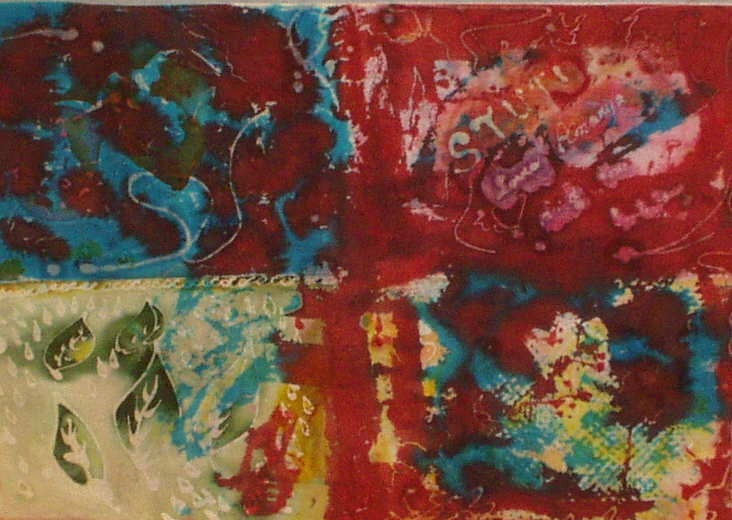 I have used oil colors on fabric using nib pen like brushes to create the nib painting. 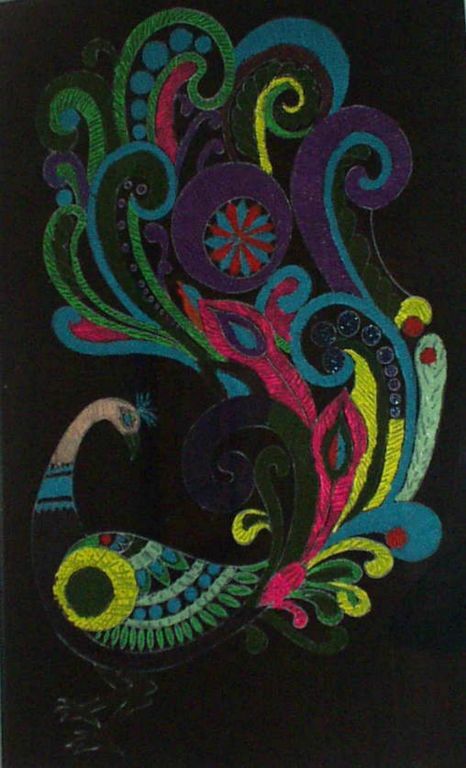 It is a technique that is found in India and I have created straight lines over various bright colors. This painting took almost three to four months to complete as the process is time consuming. 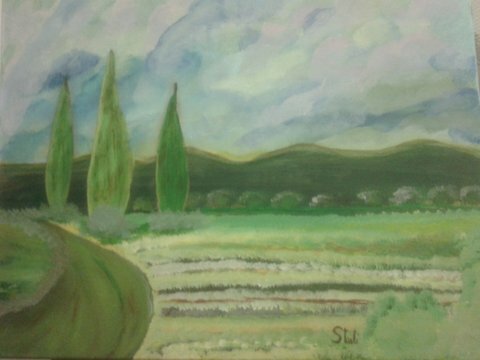 I worked in small sections then allowed the paint to dry and resumed the following day. The four seasons are represented in a clockwise direction; spring from top right, to Summer, Fall and Winter. Spring is a time when new leaves emerge on the trees and is marked by growth. 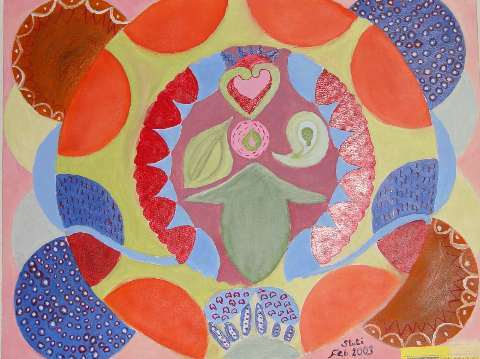 You will see the names of the artist and her immediate family members hidden in this quadrangular space that represents loving growth as they grow older and wiser in their understanding as a family. Process: The colors were laid one at a time, then the fabric was rinsed to get the access color out, dried, ironed and desired patterns were made with hot wax then each new color was applied and the process was repeated for this surface design. This is typically how Woodinville looks to me when I walk on the Wilmot Gateway Park trail or Old Pipe trail. Sometimes we see hot air balloons over the fields during the summer and in essence I wanted to capture the mood of the Woodinville vicinity area, where I live.